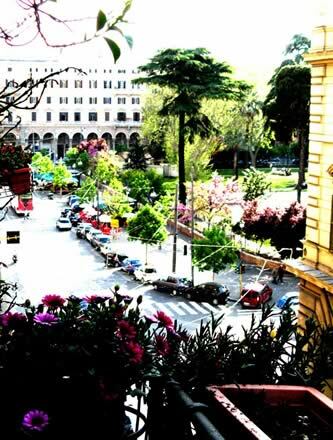 Frank's House is conveniently located in the heart of 18th Century Rome, right off the corner of one of Rome's main plazas, Piazza Vittorio Emanuele II. It's just a 5 minute walk from the central Train Station Termini, and the famed Basilica of Santa Maria Maggiore, and just a 15 minute passeggiata to the Roman Forum and Colosseum. The multi-ethnic neighborhood of Esquilino, in which it is located, is rich in both diversity and vibrant city life. Nearby mass transit stops, including the Metro and numerous bus and light-rail links, also make it an ideal and easy location to base your Roman Holiday.